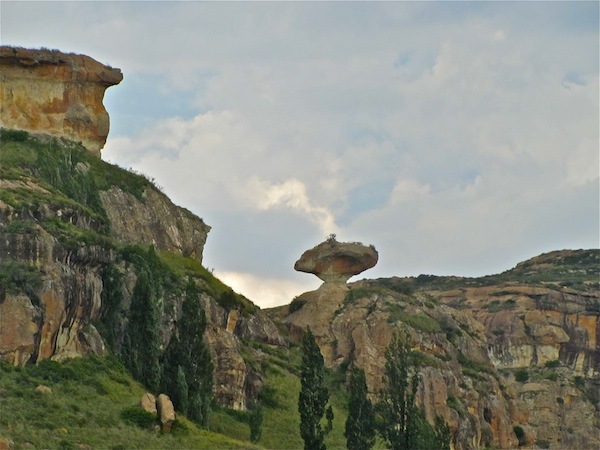 One of the most beautiful stretches of road in South Africa, the drive between Clarens and Fouriesburg is filled with incredible rock formations, views over Lesotho, and breathtaking vistas that will leave you aching to explore deeper into the Brandwater Basin. 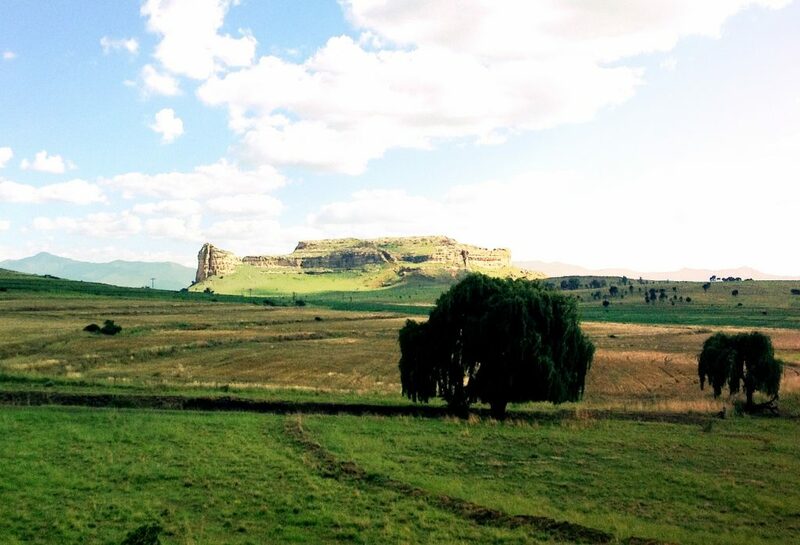 If you do the Clarens Fouriesburg drive, make sure to take a camera. Sunset and early mornings offer the best opportunities for great shots. 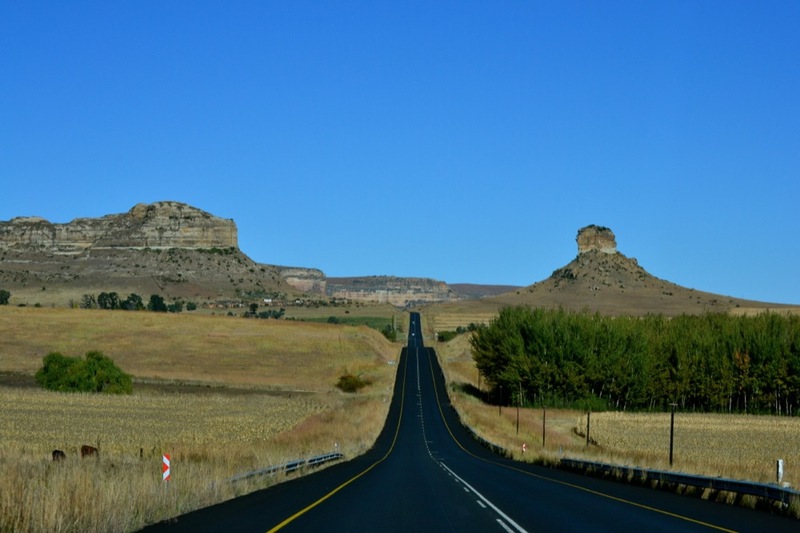 Surrender Hill is on the right as you drive towards Fouriesburg, and that same turnoff will take you down through the valley to the Sangoma Cave – largest inhabited overhang in the Southern hemisphere. 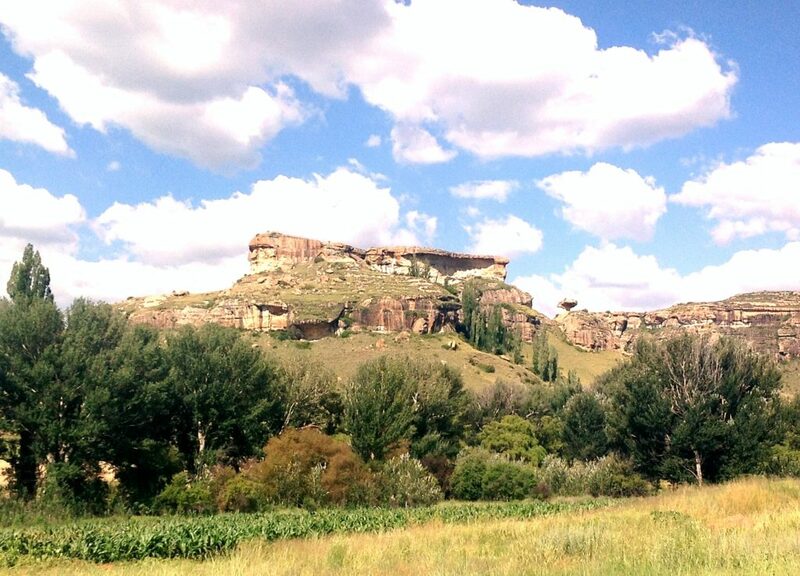 Leave Clarens on the R711 south, which is clearly signposted as the road to Fouriesburg. Soon after you leave the town, you will pass a pretty valley on the left, with a small tree-lined river meandering through it. This is the Little Caledon River, which has its source far to the east in the watershed of the Golden Gate Highlands. The sandstone cliffs that frame the valleys in the early part of this drive flaunt typical examples of rock overhangs sculptured by many thousands of years’ weathering. After about 6 kms into the drive you will cross the Little Caledon River, which runs away to the right and snakes its way around a maze of headlands until it crosses under the road again further along the drive. On the left you will see the turnoff to St Fort, a popular guesthouse and renowned wedding venue. 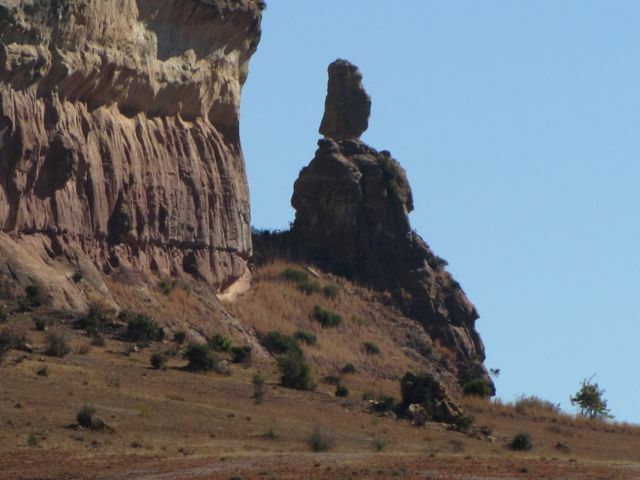 If you look back you will see the Mushroom Rock jutting above the rock shelf atop the mountain directly adjacent to St Fort. The drive takes a gradual uphill gradient now and passes various turnoffs to guesthouses and farms. After 14 kms into the drive, look out for the Surrender Hill turnoff to the right. Here you can get out and view a plaque erected to commemorate the surrender in 1900 of a large contingent of Boers during the Ango Boer War. 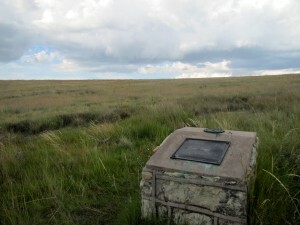 This site was originally called Slaapkranz and was declared a national monument in 1986. 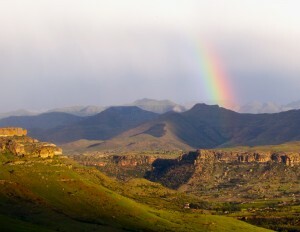 At this elevated point there are views across the vast Caledon River Valley that stretches to the distant Maluti Mountains – snow-capped in winter – and Lesotho. 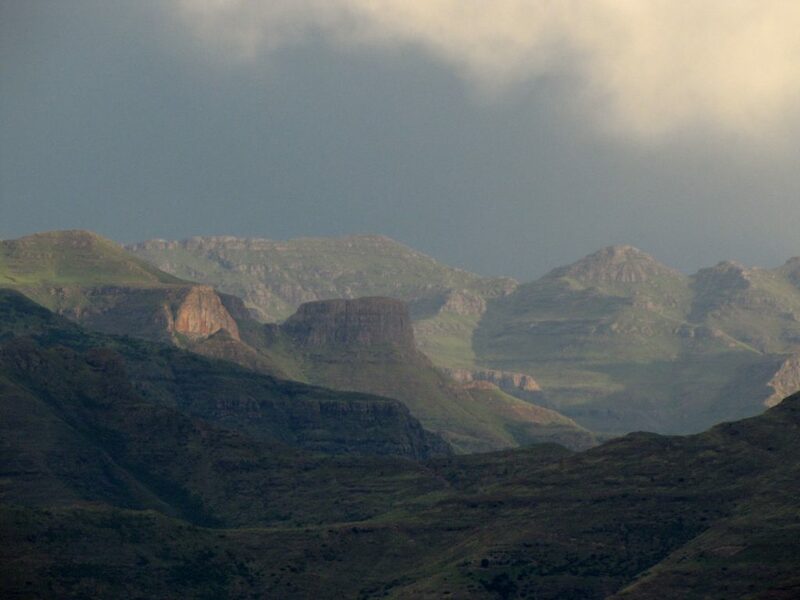 The Malutis and the Drakensberg together represent the largest and highest mountain range in southern Africa, originally formed through massive volcanic eruptions 180 million years ago. The high slopes, often visible on clear days, are also southern Africa’s most significant water catchment area. Every day, for more than a decade now, a vast volume of water from these uplands is being diverted to Gauteng by means of a tunnel under the valley before you. At the 18.5 km point, after a straight downhill stretch, two district roads from the left join the main road (separate self-drive routes will be published on these roads in due course). 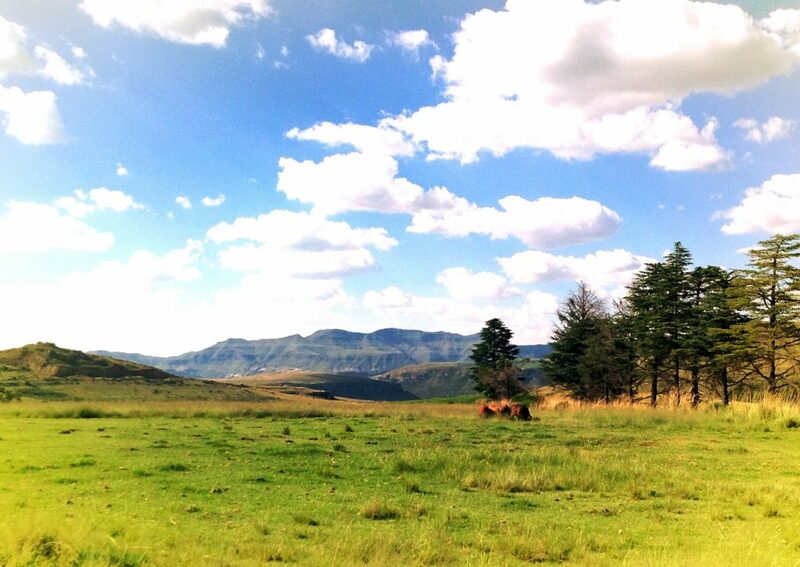 The left fork winds all the way down to the Caledon River, the boundary between South Africa and Lesotho. 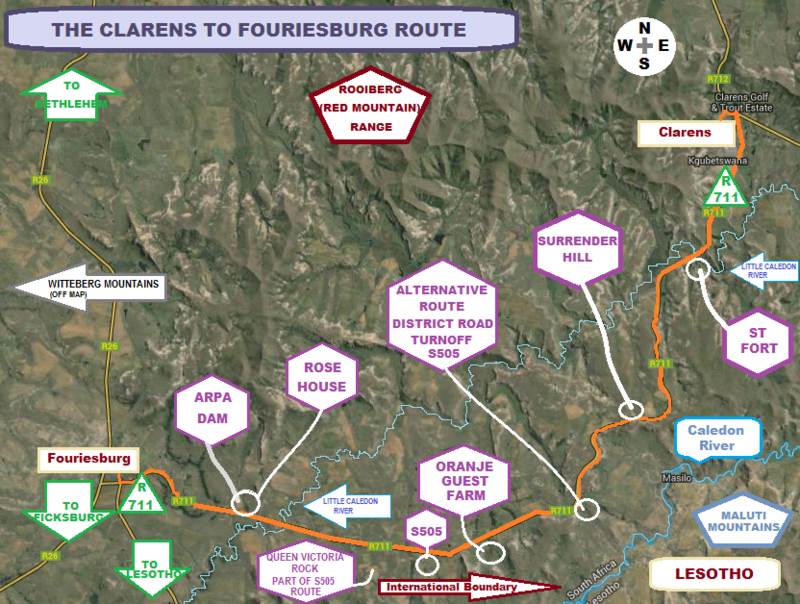 The right fork (S505) is a circular route, through pleasant farmlands with striking views, that eventually re-joins the Fouriesburg road further on. 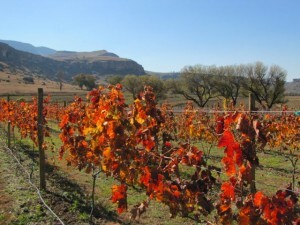 Sitting here at a picnic table you will have a magnificent view to the south of long flat-topped sandstone mountains. Standing slightly apart from one of these cliff faces is the remarkable Queen Victoria Rock, which unfortunately cannot be seen clearly from your position on the main road. 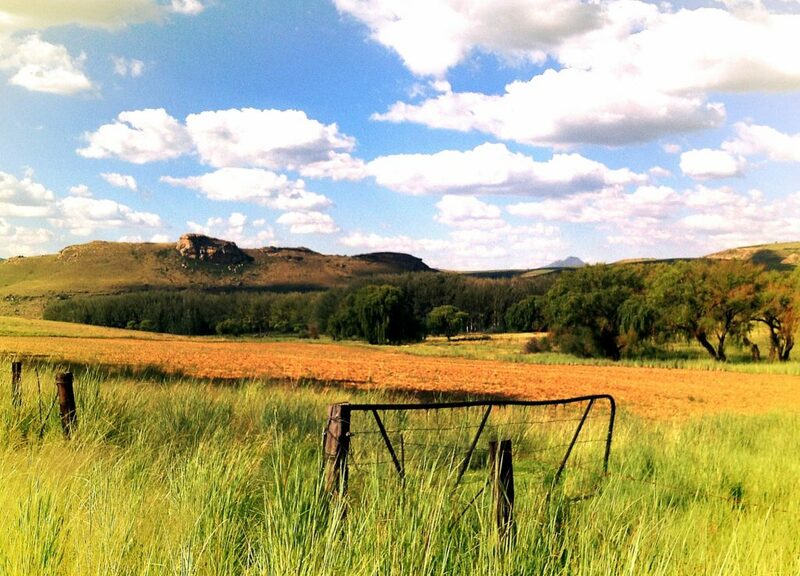 (A drive along the S505 route (signposted a short way ahead) and a visit to the Lesoba Guest Farm will afford you a perfect view of it.) To the west, on the far horizon, you will get one of your first good views of the great Witteberg Mountain Range, straddling the far end of the Brandwater Basin. A short distance further along the road, the circular drive (S505) encountered earlier will rejoin the main road. Directly after the turnoff is the Arpa Dam, part of an adventure farm. The Arpa Dam is also the venue of a winter charity swim at the end of June, called the Polar Bear Plunge, where swimmers brave the very cold water to swim a sponsored distance in aid of a local charity. The last few kilometers to Fouriesburg are on a gradual incline up the slope towards the town, which is situated against a bluff of the Rooiberg Mountain Range. To visit the town, turn right at the intersection or, alternatively, if you prefer to do the pretty drive to Caledonspoort, take the left turn. There are places in Fouriesburg town that serve teas and lunches, to freshen up before your return journey.